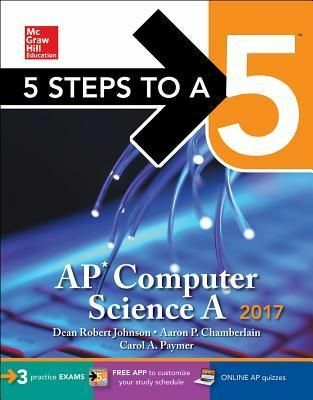 The new addition to McGraw-Hill's popular test prep series -- provides a proven strategy to achieving high scores on this demanding Advanced Placement exam. This logical and easy-to-follow instructional guide introduces an effective 5-step study plan to help students build the skills, knowledge, and test-taking confidence they need to reach their full potential. The book helps students master both multiple-choice and free-response questions and offers comprehensive answer explanations and sample responses. Written by three AP Computer Science master teachers, this insider's guide reflects the latest course syllabus and includes full-length practice exams, plus the most up-to-date scoring information.3 full-length practice examsBONUS interactive AP Planner app delivers a customized study schedule and extra practice questions to students' mobile devicesThe series has prepared millions of students for successThe effective 5-step plan breaks down test preparation into stages: 1. Set Up Your Study Program 2. Determine Your Test Readiness 3. Develop Strategies for Success 4. Develop the Knowledge You Need to Score High 5. Build Your Test-Taking Confidence.